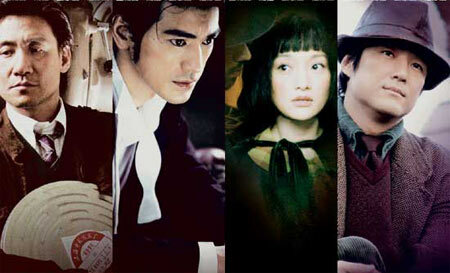 Jacky Cheung, Takeshi Kaneshiro, Zhou Xun, and Ji Jin-Hee in Perhaps Love. The Skinny: Peter Chan's musical has its share of missteps, but on the whole Perhaps Love is an ambitious and worthwhile effort, and easily one of the best Hong Kong films of 2005. Just don't let enlarged expectations of warm fuzzies get in the way. Love can be bittersweet - though sometimes, it's far more bitter than sweet. That's the prevailing feeling from Perhaps Love, the new Hong Kong musical from director Peter Chan. Takeshi Kaneshiro stars as Lin Jian-Dong, a Hong Kong heartthrob arriving in Shanghai to work on a new musical from director Nie Wen (Jacky Cheung). The film's leading lady is Sun Na (Zhou Xun), a driven-for-success actress with a popularity that extends to Hollywood. Sun Na has long been Nie Wen's partner - both on the screen and off - but this new collaboration has issues. Nie Wen doubts his creative fire, and looks to his new film to reassert his once-established filmmaking genius. Thanks to Nie Wen's artistic temperament, the relationship between the two suffers from some strain. But with the arrival of Jian-Dong, Nie Wen and Sun Na's relationship is about to get a whole lot messier. The plot of Nie Wen's musical concerns a pair of young lovers, who are separated when the girl loses her memory. The girl (played by Sun Na) is taken in by a circus ringmaster. She becomes a showgirl, and she and the ringmaster fall in love. Eventually, the boy (played by Jian-Dong) shows up, and strives to rekindle their love. The role of the ringmaster has yet to be cast, so Nie Wen eventually places himself in the role. But what Nie Wen doesn't know is that his musical is a dead ringer for reality (cinematic reality, anyway). Jian-Dong and Sun Na were actually in love ten years prior, and the dissolution of their love had everything to do with Sun Na's ambition. Now, she merely wants to forget her past, but Jian-Dong is here to right that wrong. Nie Wen, like the ringmaster, is the third party who can only watch as his new love is reunited with her old one. Art mirrors reality, and soon Nie Wen's script begins to change to reflect life. There's also singing. The love triangle of Perhaps Love is familiar stuff as plots go, but that's easily forgiven. Movie musicals are seldom known for their amazing stories, but instead for how they marry song, dance, and drama into a coherent, and hopefully enchanting whole. Unfortunately for Perhaps Love, that's where things hit a bit of a snag. Perhaps Love features many musical sequences, but they're all set within the "musical within a musical". Basically, the only time actors break into song or dance is when they're required to by the musical they're shooting. This style is much more "real" than the stagey "I feel a song coming on!" rationale that permeates most classic Hollywood musicals, but the result is an obvious distance. Characters don't really emote in their songs; instead, the songs elucidate established emotions or plot. Frequently, the songs even serve as montage, which is effective but not intimate. Some overdone editing also hurts some of the numbers, particularly the earliest ones. Ultimately, whatever power some of the musical sequences possessed feels muted by these choices. Lacking overt power to affect, the musical sequences instead rely on the actors to carry them. The effect varies here, with Takeshi Kaneshiro and Zhou Xun's singing evoking comparatively little, especially when compared to Jacky Cheung. Cheung smokes both off the screen with his rich vocals and obvious charisma during his musical sequences. This isn't to say that Zhou and Kaneshiro are bad in the film. On the contrary, both serve the script exceptionally well. Occasionally, Perhaps Love flashes back to Jian-Dong and Sun Na's happier Beijing days, and the growth and ultimate bitterness of their love affair is conveyed remarkably by both the actors. Kaneshiro has long excelled at playing handsome, yet emotionally-crippled individuals, and Perhaps Love gives him ample opportunity to fix his heartbroken puppy-dog pupils on his costar. Zhou Xun does a remarkable job with a difficult character. Sun Na's change from loving girlfriend to attention-hungry performer is spelled out mostly through visual exposition, but the actress handles her character's complexities convincingly, and with frequently touching emotion. Rounding out the quartet of lead stars is Korean actor Ji Jin-Hee as Monty, the film's narrator and lone fantasy element. Monty bookends the film with his explanation of purpose: basically, he's an emotional tax collector (or maybe a memory cop) whose purpose is to return emotions or memories to those who've forgotten or denied them. The three principal characters all fall into that category, so Monty shows up in a number of obvious disguises to guide each of them along their path to emotional rediscovery. Ji Jin-Hee does a fine job with the role, showing charisma plus a touch of humor in a film that is sorely lacking anything of the sort. The role itself is more of a plot device than a functional character, but Ji is likable and even handles his own Mandarin well. It's a credit to the actor that the underdeveloped device eventually works. Peter Chan's last feature-length Hong Kong film was Comrades, Almost a Love Story nearly a decade ago, but Chan has been busy as a producer in the ensuing years. Perhaps Love possesses many of the traits of Chan's producing works, namely a polished production, a thoughtful screenplay, and that certain something that can only be called "quality assurance". Perhaps Love doesn't just look like a good movie, it feels like one. The recent spate of Western-influenced (or maybe Korean-influenced) Hong Kong films seem to indicate quality, but it's usually more of a superficial quality than the obvious hands-on hard work that Chan's productions radiate. Complementing things are the excellent art direction and cinematography (the Shanghai sequences were lensed by Peter Pau, while Christopher Doyle brings the stark contrast of Beijing to life), which are a cut above most Asian fare, while still retaining a rough, textured feel. A love of actual filmmaking seems to go into Chan's productions (The Eye 10 notwithstanding), and Perhaps Love does evoke feeling. It's with its love story that Perhaps Love finds its ultimate success - and perhaps even its downfall. Chan has long had a keen eye towards the innate and sometimes terrible emotions that accompany love. The characters of Perhaps Love bring these emotions to life, sometimes in distressing and even disturbing ways. The result certainly feels real; love is composed of affection, sacrifice, selfishness, hate, possessiveness, and plenty of other counseling-worthy emotions, and Perhaps Love covers this territory with sometimes heartbreaking effectiveness. But the emotions are largely bitter, a tough emotion that can affect but also alienate. This is the film's biggest frustration; it's a musical that conveys a myriad of emotions - but not joy. That's not really a fault, though anyone expecting a Hong Kong Moulin Rouge (a frequent comparison to Perhaps Love) may be put off at the moroseness of some of the characters. If the filmmakers want us to root for either of Sun Na's suitors, they don't try very hard to convince us to do so.